Academic and Journalist / Recently received an MA in Liberal Studies from Columbia University, currently a graduate student at the New York University with a research focus on media and culture studies in South Asia. “The tawaf simulates the angels that circumambulate around the divine throne. Angels are immaterial beings that feed on the reality of four truths and having and carrying such realities, they possess their respective angelic duties both in this realm and the Hereafter. These four are the four pillars of the celestial manifestation of the Kabah (bayt al-ma’mur) and that’s what the Kabahs four sides represent. Once we incorporate these truths within us after attaining to the state of ihraam, spiritual life will be granted to us. By whom? By Allah through archangel Mikaa’eel. And that’s why in traditions we read that Bayt al-Ma’mur is Mikaa’eel. “In order to reach God (absolute perfection), one must become annihilated in Him and for this to be feasible, one preliminary step is that of eliminating the ego. Attention to one’s self is tantamount to being distanced from Him. To become aware of our unity with God, one must slaughter the ego. The heart is the mirror and locus through which attributes of perfection reflect. However, it needs polishing and refining. -An excerpt from Dr Farrokh Sekaleshfar’s Lecture “Hajj: The Inner (Batini) Journey”. What takes us there? Why go there at all? Who determines our objective? How and when is that achieved? Recently the Metropolitan Museum of Art in New York hosted an exhibition on the Sultans of Deccan, based on a diverse group of Shia dynasties in the subcontinent during the early modern period. The Deccan sultanates were originally part of the larger Bahmani Sultanate founded in 1347 by the Turkish governer Alauddin Hassan Bahman Shah. About eighteen Deccan Sultans ruled during the nearly 200 years of the sultanate and its but the exhibition only focuses on the period between 1500- 1700. After 1518, the Bahmani kingdom was divided in four sultanates: Barishahi (of Bidar), Qutbshahi (of Golkonda), Adamshahi (of Ahmadnagar), Imadshahi (of Berar) and Adilshahi (of Bijapur), but are collectively known as the Deccan sultanates. Komail Aijazuddin is a Pakistani artist, who often explores religious themes and issues of divinity in his work. 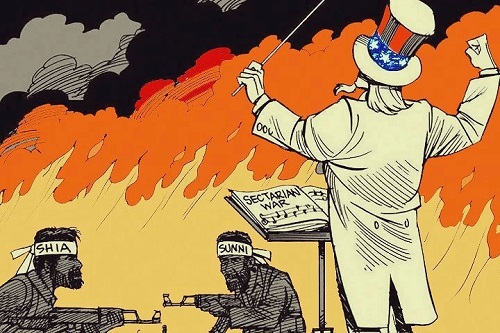 A graduate of Studio Art and Art History from New York University, he employs a style of painting that is described as ‘cold-war baroque’ and his depictions often times show Shi’i imagery which are informed by his personal background and observations during the Muharram mourning season. Recently a friend, a devout Muslim, a highly educated and well-placed professional working on the Wall Street, complained about the ‘incredible’ amount of Muharram related emails and updates that she was receiving through her social media and email. She also wondered aloud why she was receiving these messages and updates because while she was connected with various ‘Islamic’ platforms and organization, she does not subscribe to any ‘Shia’ networks. Before trashing these messages off as spam, because they ‘did not make sense’ to her at all, she then offered to forward some to me because I could better make use of this information as a ‘Shia’ who ‘worshipped these people’. 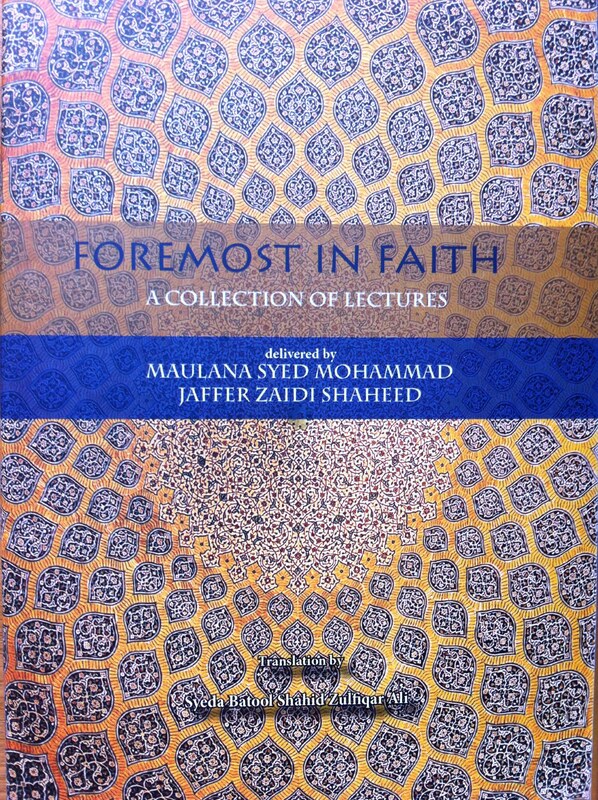 This recently published book titled ‘Foremost in Faith’ is based on a collection of lectures delivered by Maulana Syed Mohammed Jafar Zaidi Shaheed, who was a leading Shia scholar from the subcontinent. His original lectures, which were delivered in Urdu language, have now been translated into English by Syeda Batool Shahid Zulfiqar Ali. In this context, the recent translation of these lectures is very noteworthy as it allows access for the younger generation, who are not very well versed with Urdu and also are not very familiar with the thought provoking discussion and deliberations of Maulana Jafar. This publication also presents the acknowledgements and appreciations of contemporary Shia scholars from the subcontinent like Allama Syed Muntazir Abbas and Allama Talib Johari who describes Syed Jafar Zaidi as ‘a man draped in the garb of wisdom and knowledge’. It also carries special appreciatory remarks by Ayatollah Syed Aqeel Gharavi who praises Syed Jafar Zaidi as ‘an extremely reliable custodian of pure Islamic culture and values’ and also as ‘a harbinger to later generations of these humanistic as well as futuristic traditions with total scientific integrity and complete scholastic responsibility.’ Maulana Jafar was assassinated in 1980 by extremist sectarian outfits in Pakistan. The compilation includes five lectures which are all a critique and commentary on five Ayats from the Quran. The five Ayats discussed in detail in these lectures are Ayat e Vilayat, Ayat e Mawaddat, Ayat e Tatheer, Ayat e Nusrat and Surah al Asr. Another additional lecture, which focuses on Prophet Muhammad, is more of a hagiographical account that presents the Prophet as Syed ul Anbia ( Leader of the Prophets).